A friend of mine was wondering about using a Raspberry PI as a NAS, the question being: how fast is the PI at file transfers from/to an external hard disk connected via a USB rack. So I booted up my PI, mounted some random 3.5 inch Samsung 160GB SATA hard drive inside another random Spire USB-SATA external (powered) rack and gave it a go at some testing. The first thing I noticed was my rack – although connected to the PI – would not show up in the lsusb output. So I tested the rack by connecting it to the computer and it was detected just fine. The issue here could be there was not enough power left on the USB ports with the wireless LAN connected. The rack is indeed powered (as the drive requires a lot of +5 and +12V power), but the SATA/USB interface in it is actually USB bus-powered. This told me the drive is seen as sda, the partition on it being sda1. Unfortunately, after doing this I noticed I cannot write any data on the mounted partition (in /mnt/hdd/). All I got was “access denied”. 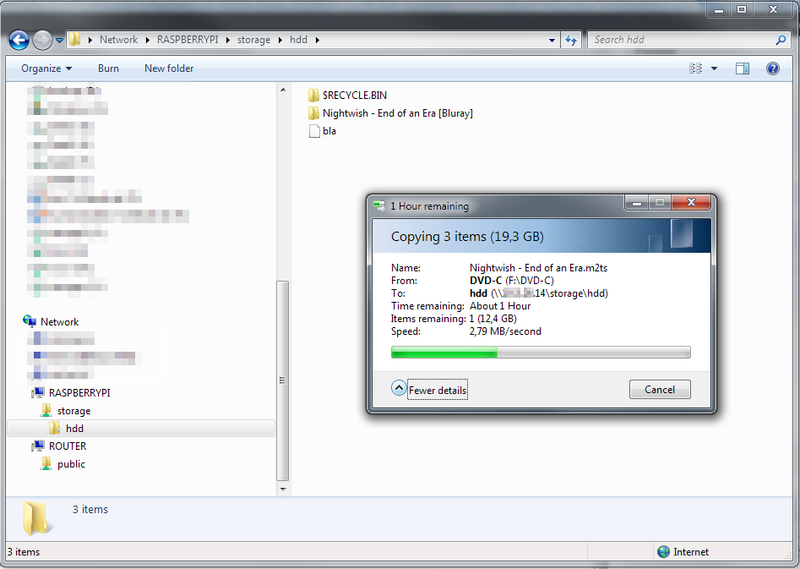 After several minutes tinkering with permissions and browsing around, I remembered about ntfs-3g. and the partition became writable. Hooray. Moving on, no NAS is complete without samba (not the dance). I wanted to just copy some big files on the hard drive, so this required a public (I did not want to tinker with permissions and logins) and writeable share. The speed is rather disappointing, a mere 2.8 MB/s. I know the network isn’t the bottleneck (a test with iperf showed me an average 60-70 MB/s Mbps or 7.5-10 MB/s) nor the drive/rack (which both can do about 25MB/s connected to my computer). I would have wished for a value closer to 10MB/s (the 100Mbps network speed), nonetheless this speed is almost acceptable for very small file transfers, or remote/online file transfers which are actually limited by the internet connection bandwidth. I must re-state I was using NTFS as the filesystem for the initial test. After receiving suggestions on using different filesystems, I re-did the test with EXT3 and FAT32. The results surprised me. That’s 7.8 MB/s (or about 62 Mbps) when using ext3 and 8.5 MB/s (or about 68 Mbps) when using FAT32. That is indeed a lot of overhead when using NTFS. Or use ExFAT, both working on Windows, Mac, Pi etc. ExFAT is a proprietary filesystem, requiring a licence from Microsoft for implementation. It is only available under Linux via FUSE (no direct kernel support yet). Can you tell us what do you use to see ext3 from windows? I don’t mount ext3 in Windows. I access those partitions through network shares via Samba. it is probably the format of the hdd with fat32 on a usb flashdrive i get 9mb per sec so try and format your drive to fat 32 i hear ext4 works better but i have not tryed.